This is the third in a series of posts on the types of bias that can affect AI systems. In the previous post we talked about bias in the algorithms themselves. With this post the series pivots to bias in the AI system’s training data. We were excited to announce this morning that we've significantly enhanced the Alegion Training Data Platform. 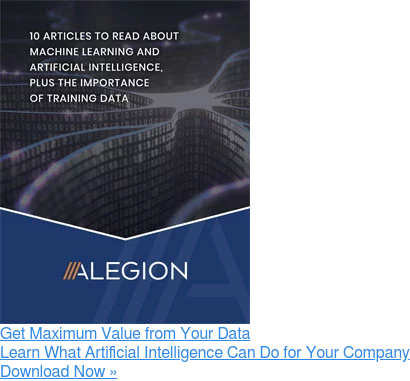 The new capabilities delivered with this release target the quality and efficiency requirements of large-scale machine learning initiatives. You can read the press release below, and if you want to learn more about the Alegion Training Data Platform our website has a dedicated page here. Machine learning (ML) enables computers to “discover patterns and relationships in data instead of being manually programmed.” This science to date is already impacting the way we live, “driving everything from Netflix recommendations to autonomous cars.” However, the more experiences that are built with ML, the more obvious it becomes that UXers are still in a learning phase when it comes to controlling the technology.